Why, hello there! We just came back from the Museum at FIT’s basement (or is it debasement?) 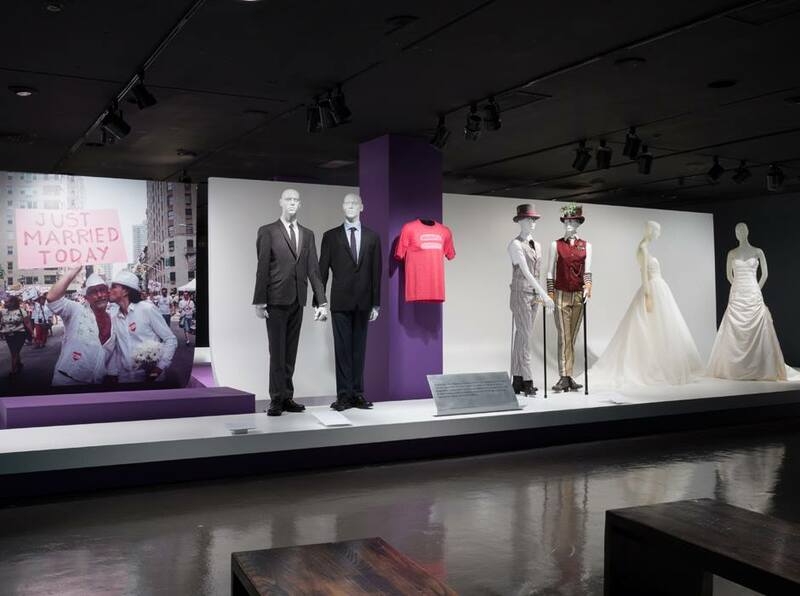 exhibition A Queer History of Fashion: From The Closet to the Catwalk. And, Mary, we just mounted all those stairs so you better believe we are winded and ready for a chat over cocktails. Emily: Since at Filthy Dreams, we believe in unbridled enthusiasm and semi-drunken gushing, let’s start with the good in the exhibition since I think we both have some serious critiques of the show. Osman: Well, we both liked artist, DJ and Times Square sleaze enthusiast Scott Ewalt’s music playlist, which ranged from Ethel Merman to Stevie Nicks to Klaus Nomi and Scissor Sisters. E: Exactly, I think the playlist tied the genealogy of queer aesthetics together, even more than the show itself did. O: It also added some proof of how this interdisciplinary web of artists actually worked together. Fashion designers were inspired by authors, musicians or by a creative muse and vice versa. That interdisciplinary aspect is an undertone throughout queer culture. E: That idea of interdisciplinary culture working together really did fill the show. Some of my favorite outfits in the exhibition such as Klaus Nomi’s suit or Joey Arias’ dress, I did not expect to be included. I’m not sure why I didn’t–I guess I expected the show to be more conservative that it was. These underground figures, who have been very important to me and the Downtown fashion era that I love, vividly depict the merging of fashion, art, music and life. O: Also what we see as creative and avant-garde fashion today like Lady Gaga can be directly traced to these figures who have already established themselves as living art forms. E: And I wanted to steal some of those outfits. 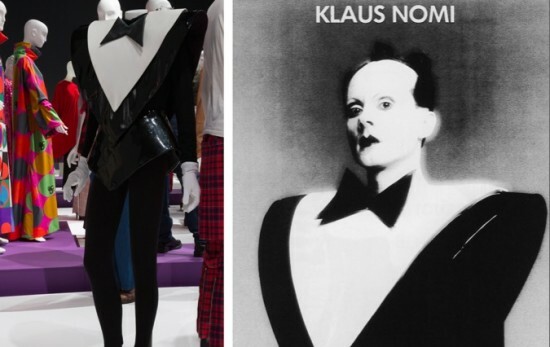 I was ready to run away with the Klaus Nomi and Quentin Crisp mannequins under my arms. O: Talking about the combination of art and life, I’m wondering why Freddie Mercury wasn’t included in the show. He completely fits with his stage outfits and his place particularly in the history of the AIDS crisis, which was well-represented in the show. E: I think we could play that game with the entire exhibition–why were some artists included and others ignored? 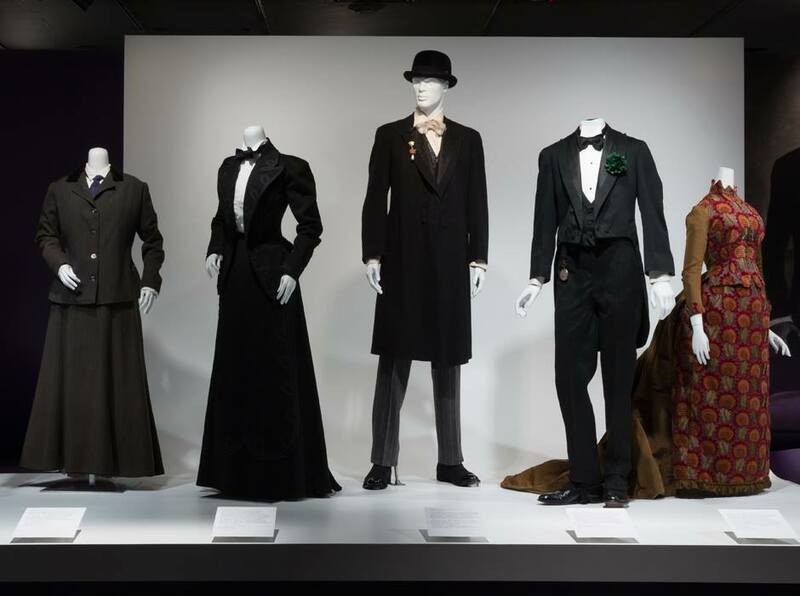 O: I also like how some not obviously queer-related fashions appeared in the exhibition, showing how they also served as inspiration for queer culture. For example, Marlene Dietrich’s suit clearly indicates a play with female masculinity and sexuality. However, it doesn’t immediately look queer from a contemporary viewpoint. At that time, a woman wearing a man’s suit was a political statement as much as a fashion choice. E: And that’s where the real strength of the show lies for me: in fleshing out this genealogy of queer aesthetics, which has been looked into recently with exhibitions like Hide/Seek:Difference and Desire in American Portraiture and publications like Art & Queer Culture. I think A Queer History Of Fashion is an important exhibition in the context of these other shows and publications. O: The press release also mentions that the fashion world has been one of the most welcoming circles for queers. Ignoring the connection between the two is unimaginable. E: And you can see that in the show. It is almost easier to trace a queer history in fashion than it is in, say, portraiture. Even in Hide/Seek, primarily the fashion in the portraits indicated the presence of queer sexualities and gender play. There’s more of an overt performance of gender and sexuality with fashion. O: It’s also interesting to take the show in relation to the recent Punk:Chaos To Couture exhibition at the Metropolitan Museum of Art. It’s fascinating to see how different subcultures correlate and intersect. Seeing the Punk show a few months ago and then seeing A Queer History of Fashion, these two subcultures carry traces of one another. E: That is interesting, particularly since punk is often associated with white, usually heterosexual men. Not that there weren’t queer punks, just look at my favorite trans-punk Jayne County. However, punk fashion does totally align with the leather daddy look. O: Punk can also be queer-there’s David Bowie and Iggy Pop who are certainly not entirely straight. It’s similar to the Beats–Jack Kerouac had relationships with men but is often labeled as heterosexual. But that reminds me: why wasn’t there an Allen Ginsberg outfit? Queer fashion doesn’t have to be all ripped jeans and leather. However, my main question and critique is this: is this a political show about fashion or a fashion show about politics? I think the best example of this indecisiveness is the three wedding outfits at the end of the exhibition. E: And here is where my whining starts too. 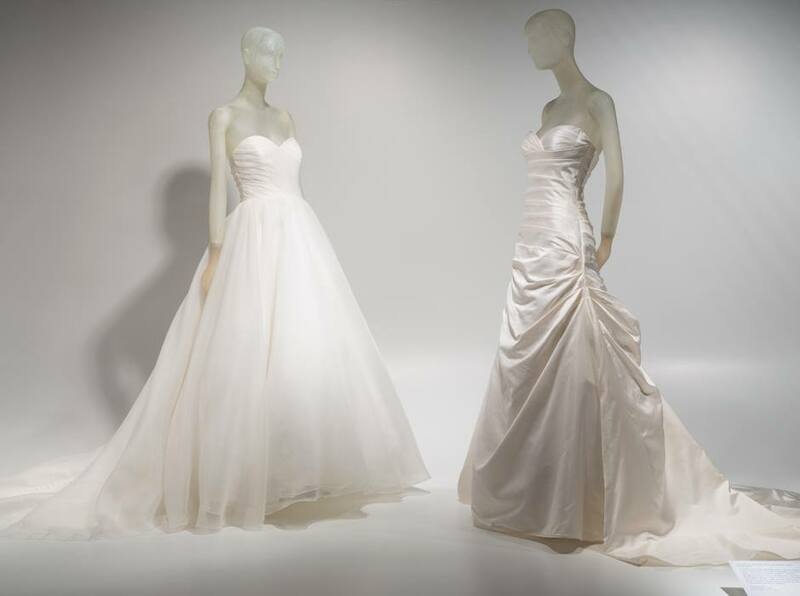 I understand that the curators Fred Dennis and Valerie Steele were trying to end the show with wedding ensembles, mirroring how a couture fashion show always ends with the wedding dress. But in setting the show up this way, they perhaps inadvertently positioned gay marriage as the contemporary pinnacle of queer life and fashion. Meanwhile, other than the dandy lesbian wedding outfits, the wedding fashions were completely (homo)normalized: Brooks Brother-esque suits for the men and some, let’s be honest, David’s Bridal-looking dresses for the women. I mean, seriously? O: Is this as high as it can go? E: I think the real problem here is not only holding up gay marriage as the pinnacle of the queer fashion legacy but it also completely ignores other contemporary queer fashion, particularly the influence of transgender and genderqueer fashions. In fact, most of the show was entirely cisgender. I think a lot of very avant-garde fashion today comes from the genderqueer and transgender community. Other than Joey Arias and RuPaul’s dresses, the show missed a lot of important transgender fashion influences. Even transgender and genderqueer street fashion is at the forefront of subversive gender performance. O: The exhibition gave the audience the most popular figures. I particularly did not like the inclusion of some designers such as Christian Dior, whose clothes did not fit the theme other than being created by a gay designer. In the fashion world, many designers are gay, which does not necessarily make them important in the legacy of queer aesthetics. I would have preferred to see work by DSquared2, created by identical twin gay brothers Dan and Dean Caten. They are queer designers not only through their fashion but also through their queer lifestyle. Obviously, Dior is more high fashion and academic for FIT. E: I certainly understand why they included designers like Alexander McQueen and John Galliano in the show but for some, like Dior, it just felt like they needed to pad out their high fashion in the show to counteract the amount of street fashion, coming from underground culture and activism rather than out of the big fashion houses. Looking at the show as a whole, it is an unquestionably important step in mining the archives of creative fields, highlighting the genealogy of queer aesthetics and hopefully, there will be many more exhibitions improving on the work of A Queer History Of Fashion. Tags: A Queer History Of Fashion, Fashion Institute of Technology, Joey Arias, Klaus Nomi, Lady Gaga, Marlene Dietrich, Punk: Chaos to Couture, queer aesthetics, queer fashion, Quentin Crisp, Scissor Sisters, Scott Ewalt, Stevie Nicks, The Museum At FIT. Bookmark the permalink. Great talk here. Love the tone, the enthusiasm is infectious. Thanks for including the Jayne County reference. If I can add some backdrop to punk and gays in the late ’70s/early ’80s, it’s not widely acknowledged, but punk was an understated and welcoming cultural haven for gay teenagers of the time, in particular around (but not limited to) the San-Francisco based Dead Kennedys. It’s hard to grasp in the age of pop-punk and Hot Topic but, in that period, punk was wildly reviled by the mainstream, and many local scenes were openly welcome to the socially alienated. I’ve found myself pleasantly surprised on more than one occasion when otherwise conservative-appearing gay men in their forties react with positive nostalgia to my Dead Kennedy’s shirt! Thanks for reading! And yes there is a definite cross-over in the punk scene and queer scene. Jose Munoz talks about that cross-over in a chapter of “Cruising Utopia,” admittedly a book which I largely side-eye for a smattering of reasons, but the chapter talking about his own experiences in the crossover between punk and queer in Miami as well as Kevin McCarty’s photographs is definitely the high point in that text.